As the Lord Word Worm Puzzle difficulties increase, it becomes harder to solve the puzzles by blindly trying different words. Expert level puzzles are almost impossible without logical deductions. Players should logically solve as much of the puzzle as possible before resorting to trial and error. Sometimes the cycle of logic followed by trial and error will need to be repeated several times as you progress through to the solution. Usually, the first step to solving a difficult puzzle is to reduce the number of potential paths, by filling in as many joins as possible. You may also find it helpful to draw "walls" between hexes to indicate a join is impossible in that position. 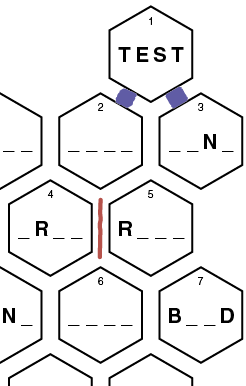 Then, when a hex can be joined to only two other adjacent hexes, you can mark in the join. Sometimes two adjacent hexes will have impossible combinations of letters, indicating that a join cannot occur between them. For example, if two adjacent hexes have more than one letter different, it's not possible to join the two together. Or, if the combining of the known letters from the two hexes cannot form an English word (eg a pair of letters that never occur together in the English language) then they cannot be joined. We must join hex #1 with #2 and #3 because #1 is adjacent to only two hexes. 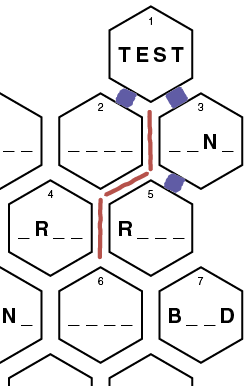 We can also draw a wall between hex #4 and #5. 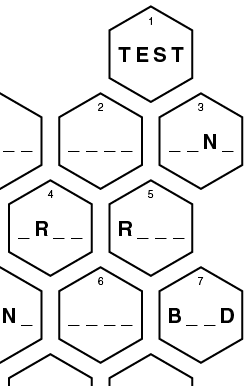 If these two hexes were joined, one of the hexes would contain a four-letter word beginning with "RR". We know that this is impossible in the English language. We can now fill in the missing letters based on the links so far. We also know that hex #5 cannot join #7 because they have two letters different. Therefore, hex #5 must join #6. Finally, hex #6 must join #7 (since hex #7 must join with two adjacent hexes), and now the transition of letters can be filled in. 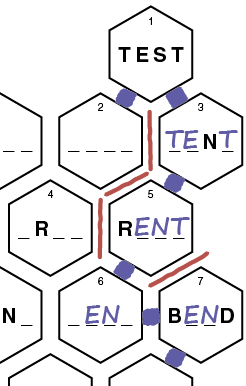 In the example above, notice we filled in the "EN" in hex #6? Because the "R" in hex #5 needs to become "B" in hex #7, and the "T" in hex #5 needs to become "D" in hex #7, it will take two steps. Therefore, no other letters can change in those two steps. 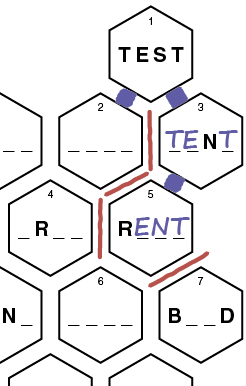 In this example, hex #6 could either be "REND" or "BENT". Somewhere further along the worm, one of these words will be used, thus determining the unused word to place in hex #6. You will develop many other transition rules as you practice. For example, if you have the word _E_ _ going to _ _ _ _ then to _E_ _ , what can you determine about the middle word (hint: words cannot be repeated)?